Hello beauties! Today's post is the first in a long-awaited series, addressing one of your biggest concerns and one of my most frequently asked about topics: Skin Care and My Skin Routine. 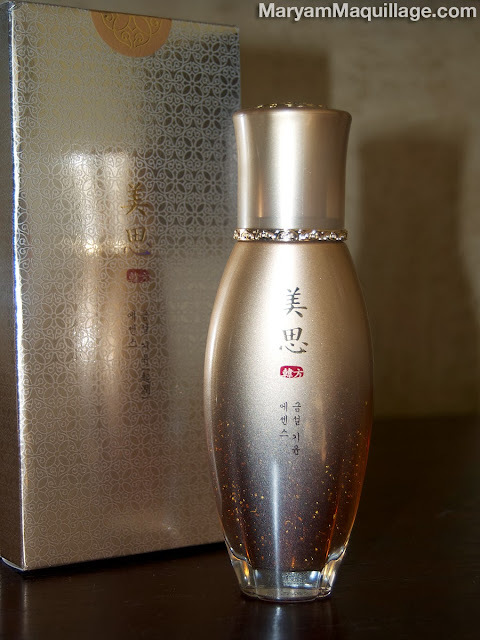 To launch this important blog series, I'm starting with one of my most loved lines from a stand-alone category -- Oriental Herbal Medicinal Skin Care featuring Missha Geum Sul "Golden Snowflake" line. Oriental Herbal Medicinal Skin Care has been hugely popular in Asia and is now sparking the interests outside of the continent and gaining a large global following. Korean herbal skin care lines have been in the forefront of this beauty movement with Amore Pacific's Sulwhasoo and Missha's (MISA) Geum Sul "Golden Snowflake" lines leading the way. These herbal medicinal lines combine the philosophy of eastern medicine and the nature-derived ingredients known for their medicinal effectiveness. Focusing on the balance of Yin and Yang, these ingredients treat the skin from within, culminating the most harmonious beauty. 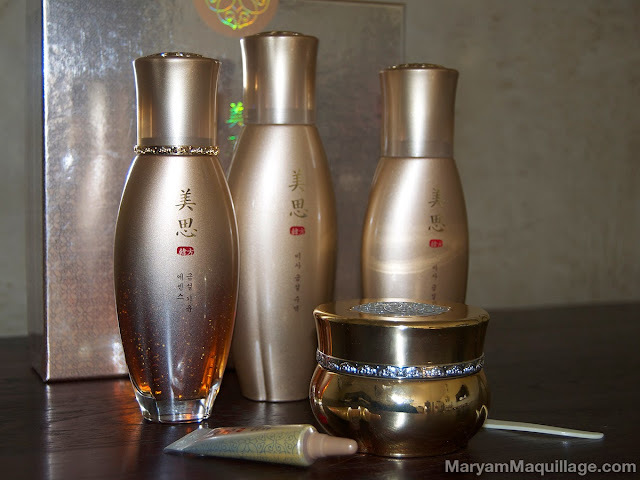 The "Golden Snowflake" line from Missha has been increasing its reputation for its innovative science with mild formula and by staying true to traditional Korean aesthetic appeal. My Skin: Combination -- oily in the T-zone, dry around the mouth. Acne-prone. My Skin Concerns: Occasional breakouts, dark spots, dullness, sallowness, enlarged pores. MISA "Golden Snowflake" First Essence Booster -- This highly-concentrated booster is the first step to my daily skin routine. Made with wild ginseng known for its ability to refine the skin and promote cell turnover and extracted based on gold, which is known for its purifying effect, the first essence booster frees the skin of toxins, improves skin texture and helps achieve a clearer complexion. Other functions include oil-moisture balance, nourishment, wrinkle repair and whitening benefits. The mild-formula and gel-like consistency absorb fast addressing all of my skin concerns and achieving the purported results. This product is made without Colorants, Parabens, Triclosans, Mineral oils, or GMO's. Contains Spiceberry Extract (Ardisia Crenata), patent ingredient for anti-inflammatory and anti-irritation. MISA "Golden Snowflake" Vitalizing Day Cream -- This rich nourishing daily protectant cream moisturizes and shields the skin with SPF15 from environmental factors like UV rays and pollution. Although this cream is heavier than most Western creams, it absorbs quickly and provides the dual function of a high end wrinkle combatant and a daily moisturizer. I like to use this cream in the morning, as the last step of my skin care routine. 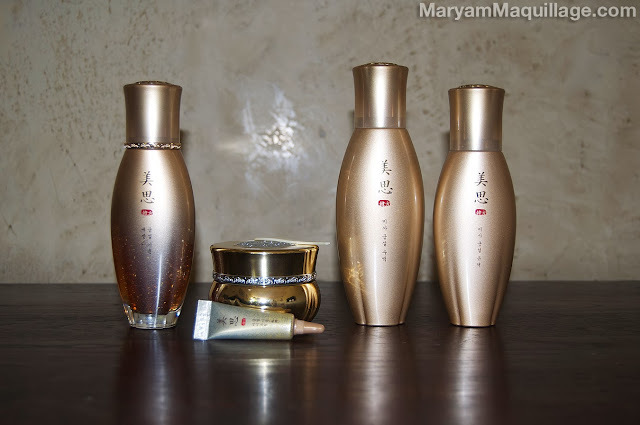 Missha "Golden Snowflake" Set I -- This set comes with two sizes of MISA Geum Sul Skin Toner (second from right) and two sizes of MISA Geum Sul Milky Emulsion (far right). MISA Geum Sul Skin Toner -- this unique jelly-like toner can be used for day or night and functions as the second step to your skin care routine, after the First Essence Booster. Made with the noble ingredients of the Geum Sul line, this toner also contains 100% Ginseng Water, made from the ginseng collected in Geumsan, Korea which is famous for the best quality of ginseng around the world. 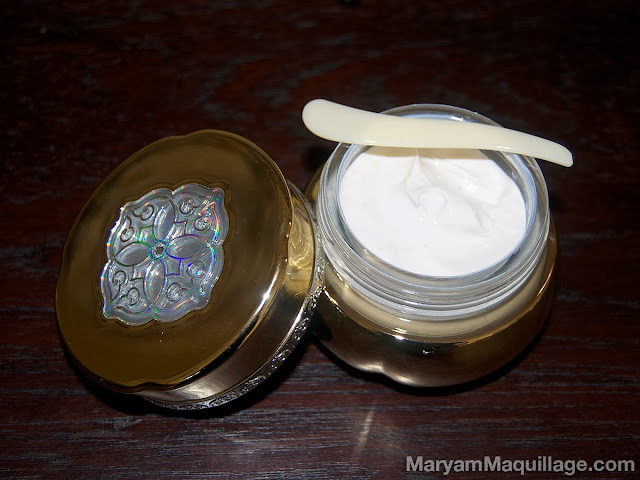 MISA Geum Sul Milky Emulsion (not sold separately) -- The third step to my day or evening skin care routine, this creamy emulsion provides moisture and seals in the active ingredients. 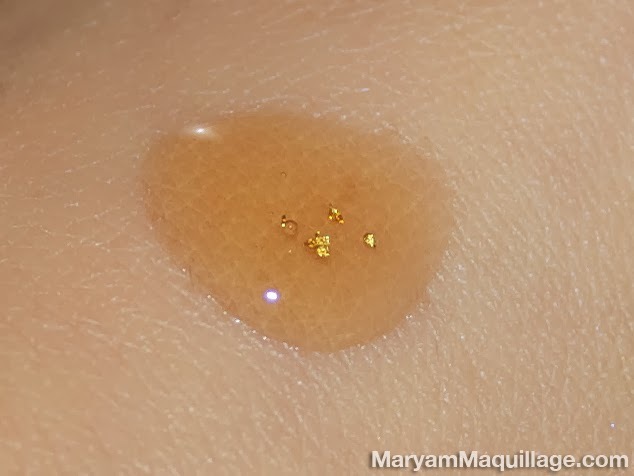 MISA Golden Snowflake Eye Cream (miniature) -- made from the aforementioned ingredients of the Geum Sul line, this premium oriental eye cream reduces fine lines, wrinkles, and shadows around the eyes. Reishi Mushroom Extract helps achieve a more youthful, brighter appearance. The Verdict: I first noticed immediate results on day 3 of using Missha's Geum Sul line. My skin felt tighter and plumper, and the texture appeared smoother. After just two weeks of usage, my skin looked brighter and my tone evened out resulting in a much more radiant complexion. These results were also noticed by Lee, my Mr. Maquillage, who had been using the toner and the milky emulsion. Because he doesn't wear makeup, his results were even more apparent -- his skin looked more youthful and refined. Since starting this routine, I have not experienced a single breakout on my face and will give credit to the purifying function of the herbal medicinal ingredients featured in this line. Bottom Line: I get the hype -- this routine has 100% worked for me. So much so, I was even invited to film a segment for a Korean prime-time documentary about Korean Herbal Medicinal Skin Care and it's global beauty road. The documentary will air on SBS Korea on October 27th at 7:30PM. As a beauty blogger, I am fortunate to be able to test out a lot of products from all over the world, so everything expressed here has been curated to present only the products that I find to be the most effective. 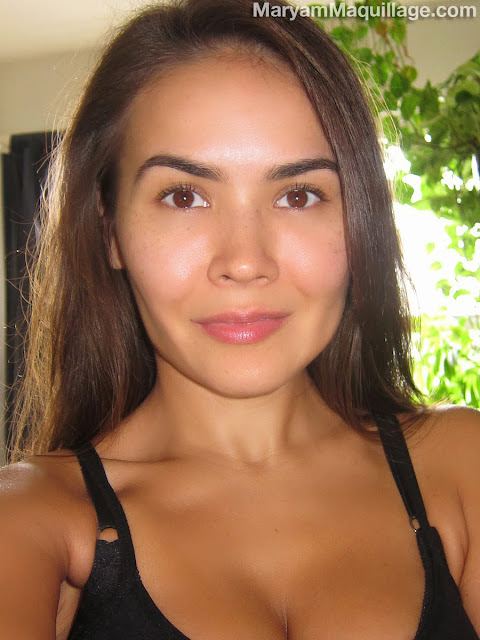 I want to point out that what has worked for me may not necessarily work for everyone, so developing your own routine and knowing your skin concerns are key. Having said that, I assure you that the products I write about on this blog space have all been personally tested by me (and my Mr. Maquillage) and have worked successfully in achieving its purported results. Wow -such flawless & glowing skin. Resourceful Blog. Thanks for sharing your skin care tips and it helps us to keep our skin well. Nice blog!! Eye is a precious wealth of our body. So, take care of it. Sakare products help me to make a statement with eyes that entice.